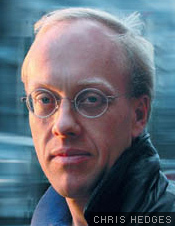 Many charges have been leveled at foreign correspondent Chris Hedges over the years, but shrinking from conflict isn't one of them. Hedges spent nearly seven years as Middle East bureau chief for the New York Times, covered the wars in Bosnia and Kosovo, and was part of the New York Times team that won the 2002 Pulitzer Prize for its coverage of global terrorism. He took on the American military-industrial complex with his books "War Is a Force That Gives Us Meaning" and "What Every Person Should Know About War," and provoked the rage of the Christian right by likening them to Nazis in last year's "American Fascists." Hedges now cements his reputation as an intellectual provocateur with the charmingly titled "I Don't Believe in Atheists." Though Hedges, a Harvard seminary graduate and the son of a Presbyterian minister, considers himself a religious man, his quarrel with the New Atheists goes beyond theological concerns. In "I Don't Believe in Atheists," he accuses Hitchens and the others of preaching a fundamentalism as dangerous as the religious fundamentalist belief systems they attack. Strange bedfellows indeed -- according to Hedges, the New Atheists and the Christian right pose the greatest threat facing American democratic society today. Hedges spoke to Salon by phone from his home in New Jersey. You say that "I Don't Believe in Atheists" is a product of confrontations you had with Christopher Hitchens and Sam Harris. How did those debates inspire the book? In May of 2007 I went to L.A. to debate Sam Harris, and then two days later I went to San Francisco to debate Christopher Hitchens. Up until that point, I hadn't paid much attention to the work of the New Atheists. After reading what they had written and walking away from these debates, I was appalled at how what they had done for the secular left was to embrace the same kind of bigotry and chauvinism and intolerance that marks the radical Christian right. I found that in many ways they were little more than secular fundamentalists. Although I come out of a religious tradition -- I grew up in the church, my father was a Presbyterian minister, I graduated from seminary -- I've spent my life as a foreign correspondent, mostly for the New York Times, and I have a pretty hardheaded view of the world. I certainly understand that there is nothing intrinsically moral about being a believer or a nonbeliever, that many people of great moral probity and courage define themselves outside of religious structures, do not engage in religious ritual or use religious language, in the same way that many people who advocate intolerance, bigotry and even violence cloak themselves in the garb of religion and oftentimes have prominent positions within religious institutions. Unlike the religious fundamentalists or the New Atheists, I'm not willing to draw these kind of clean, institutional lines. A lot of people would find it counterintuitive that you would go from your last book, "American Fascists," which was a scathing critique of Christian fundamentalism in the U.S., to writing against atheism. Do you see these as connected projects? I do. I didn't start out that way, because these guys were not on my radar screen. I think a lot of their popularity stems from a legitimate anger on the part of a lot of Americans toward the intolerance and chauvinism of the radical religious right in this country. Unfortunately, what they've done is offer a Utopian belief system that is as self-delusional as that offered by Christian fundamentalists. They adopt many of the foundational belief systems of fundamentalists. For example, they believe that the human species is marching forward, that there is an advancement toward some kind of collective moral progress -- that we are moving towards, if not a Utopian, certainly a better, more perfected human society. That's fundamental to the Christian right, and it's also fundamental to the New Atheists. You know, there is nothing in human nature or in human history that points to the idea that we are moving anywhere. Technology and science, though they are cumulative and have improved, in many ways, the lives of people within the industrialized nations, have also unleashed the most horrific forms of violence and death, and let's not forget, environmental degradation, in human history. So, there's nothing intrinsically moral about science. Science is morally neutral. It serves the good and the bad. I mean, industrial killing is a product of technological advance, just as is penicillin and modern medicine. So I think that I find the faith that these people place in science and reason as a route toward human salvation to be as delusional as the faith the Christian right places in miracles and angels. Don't you think that a belief in perfectibility or progress may be necessary for people who devote their lives to big endeavors, like, say, developing vaccines? Americans especially are known for big dreams. It seems like to lose the idea of progress would be a kind of defeatism. But you say in the book that the Holocaust, because it was framed as a modern project and an outgrowth of technological advance, was that kind of scientific progress, as well. Well, I wouldn't quite say it that way. I would say that the fascist agenda was Utopian, and that it adopted the cult of science. That's what leads Hitler to try and breed humans and apes to try to create an oversized warrior or to send expeditions to Tibet to find a pure, Aryan race. I mean, that's not science. It's the cult of science, and I think the New Atheists also make that leap from science into the cult of science, and that's a problem. So you think that Hitchens, Dawkins and Harris are just shills for a neocon agenda? Well, Dawkins is a little different, because he's British. But looking at our own homegrown version of new atheism, yes. Hitchens and Harris do for the neocon agenda in a secular way what the religious right does in a so-called religious way. It was better, for her. She doesn't qualify that. She says it's better. Well, she's speaking out of her personal experience, and it was better for her. I mean, look, I covered conflicts in Africa, in the Middle East, and in Central America, where Western society rained nothing but death and destruction on tens of thousands of people, which is of course what we're doing in Iraq. So, is Western society -- American society -- better for Iraqis? And I think part of the problem is people who create a morality based on their own experience, which is what of course the New Atheists and the Christian fundamentalists have done. You believe new atheism has emerged in reaction to religious fundamentalism, but I wonder if you also see it as a reaction to a kind of cultural relativism and multicultural mind-set that a lot of people perceive as weak and self-destructive, in its tendency to sympathize with enemies. Well, "enemies" is a pretty loaded word. Let's say al-Qaida -- those whom we can with few qualifications say are in an antagonistic relationship with the West. Well, I've spent a lot of time in Gaza with Hamas, with people who have an antagonistic relationship with the West. Circumstance, fate, nationality, geography create different reactions, and if I had been born in Gaza, especially given the horrific Israeli assault at the moment in Gaza, and had stood by for 60 years while the outside world ignored the injustices committed against the Palestinian people, who knows how I'd react? I think people who start dividing the world into us and them fail to have empathy. Are you saying you might be a jihadist, if you had that upbringing? I spent so long in war zones that I think we don't know what we would do under repression and abuse -- you know, if somebody killed my father. That's the brilliance of the great writers on the Holocaust, like Primo Levi and [Bruno] Bettelheim. They understood the humanity of their own killers. That line between the victim and the victimizer is razor-thin. We all carry within us the capacity for abuse, and I think that's the most disturbing lesson you walk away with when you cover wars. We're all capable of evil, under the right circumstances, and very few of us are immune. A lot of the book is devoted to making this comparison between Christian and what some call secular fundamentalists, but you are pretty hands off when it comes to fundamentalist Islam. The only reason I go after Christian fundamentalists and New Atheists is because they're here and I'm an American. Fundamentalism -- whether it's Hindu fundamentalism or Jewish fundamentalism or Christian fundamentalism or Islamic fundamentalism -- is the same disease. Karen Armstrong has explained that brilliantly. Fundamentalists, no matter what their religious coloring -- bear far more in common with each other than they do with more enlightened members of their own religious communities. I'm an enemy of fundamentalism, period. And if I'm not going after Islamic fundamentalism in this book, it's because what I've tried to do is talk about these two very dangerous ideological strains within American society, although the New Atheists are peddling this under the guise of enlightenment and reason and science in the same way that the Christian right tries to peddle it as a form of Christianity. I want to go back to what you see as the ultimate threat of the New Atheists and the Christian right. You voice concern in the book that these two groups of fundamentalists are going to gang up, "to call for a horrific bloodletting and apocalyptic acts of terror..."
It's a possibility. I mean, I covered al-Qaida for the New York Times. There wasn't an intelligence chief who I interviewed who didn't talk about another catastrophic attack on American soil as inevitable. They never used the word "if." They just used the word "when," and if this kind of rhetoric, which is racist, is allowed to infect the civil discourse -- whether it comes from the Christian right or the New Atheists -- toward Muslims, who are one-fifth of the world population, most of whom are not Arabs, then what I worry about is that in a moment of collective humiliation and fear, these two strands come together and call for an assault on Muslims, both outside our gates and on the 6 million Muslims who live within our borders. And that frightens me, that demonization of a people -- turning human beings into abstractions, so that they're not human anymore. They don't have hopes, dreams, aspirations, pains, sufferings. They represent an unmitigated evil that must be vanquished. That's very scary, and that is at the bedrock of the ideology of the New Atheists as it is with the Christian fundamentalists. I wonder if by calling people racist and imperialistic and illiterate, you run the risk of not being taken seriously by those you most want to reach. I'm not really interested in the impact. I'm interested in explaining as honestly as I can, regardless of the consequences, what I see. So why ever engage in these debates? You make it seem pretty futile. Well, I've only done two of them. Is it futile? I don't know. I think if one is given a public platform or a voice, he should use it.